Anyway, the Monday challenge at art aMUSEment, was to design with "Spring" as our theme. Perfect timing to help boost my spirits. The background of my journal page was made with washes of acrylic paint in light green and ivory yellow, allowing some areas to be darker while other areas were lighter in both colours. I used my Plaid Decorator Block Stamp - Ivy (this line of stamps have been discontinued for some time now but occasionally will pop up on eBay) to add the ivy leaf impressions in a darker version of the green. I next used an ivory/white acrylic with my home-made diamond patterned foamie stencil. This stenciling was placed on the diagonal of the page to emulate a trellis pattern. When making foamie stamps and stencils some time ago, I had created a stamp of three little flowers, chained together. I next used that stamp with the ivory-yellow acrylic to create random flowers. The centers were dotted with a mixture of Quinacridone Red and Burnt Sienna. To give the page more texture, I used some of the silk leaves that my friend, Andrene from art aMUSEment had sent me for use with stamping texture on my backgrounds. She was extremely generous with her gifted silks and I have plenty to spare for the original purpose as well. 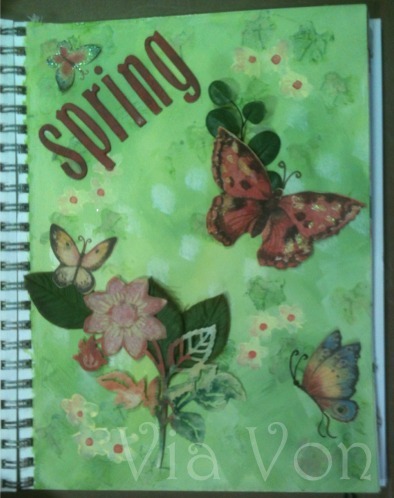 :-) The large flower, butterflies and "spring" letters are diecuts. The letters were painted with the same colour as the chained flower dots.